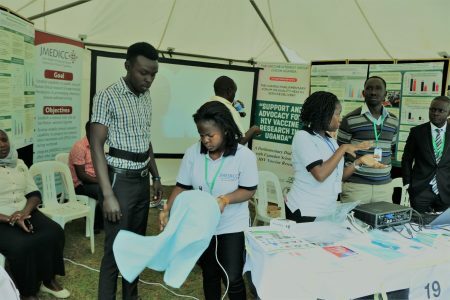 On Thursday 26 July, Makerere University Walter Reed Project (MUWRP) participated as one of the ‘key’ exhibitors at the Uganda Virus Research Institute (UVRI) Open Day that was held at the Institution’s campus in Entebbe. 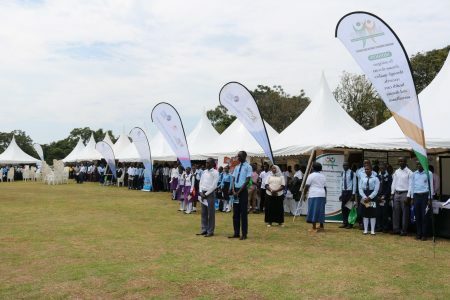 This was the fifth edition of the UVRI Annual Science open day that brought together about 2,000 students from more than 25 secondary schools in Wakiso, Kampala, Sebei and Arua districts aimed at opening their eyes towards pursuing scientific career paths. This year’s open day was organized under the theme “Science for a healthy world”, providing an opportunity for young people interested in science to learn about scientific research, interact with practicing scientists and researchers as well as explore the possibility of a science – research career. This was also an opportunity for the students to explore science outside their classrooms. The MUWRP team was led by Dr. Prossy Naluyima Sekiziyivu, the Laboratory Director. MUWRP showcased a stall that attracted visitors; students, their teachers and other partners to learn about the different research and service activities conducted by MUWRP. Specifically, the team displayed MUWRP’s work portfolio guided by a pre-recorded project documentary. Other demonstrations included the Joint Mobile Emerging Disease Intervention Clinical Capability (JMEDICC) program, science of the Emerging Infectious Diseases Program (EIDP) and the demonstration of MUWRP’s laboratory capacities. 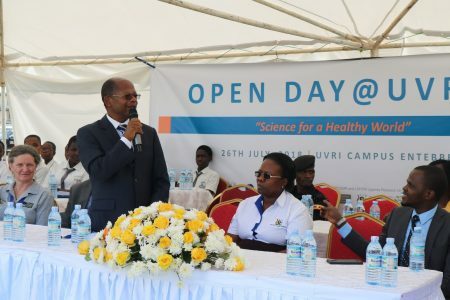 Prof. Pontiano Kaleebu, the director of Uganda Virus Research Institute in his capacity as the host greatly appreciated the students and other guests for accepting the invitation to the UVRI open day. He gave a brief history of UVRI, where he described the institution as a government of Uganda establishment that was started by The Rockefeller Foundation in 1936 to carry out research on Yellow fever. He said, “Over time, UVRI has discovered and studied a number of viruses including the Zika virus and is one of the leading institutions with most scientific publications, only coming next to Makerere University”. He also mentioned that through UVRI’s direct research projects and its numerous partnerships across the country, there are a number of cutting-edge research projects that have been accomplished including discovering that circumcision can reduce the risk of acquiring HIV, a study conducted by Rakai Health Sciences Program, another research project under the UVRI umbrella”. The guest of honor Hon. John Chrysestom Muyingo, the Minister of state for Higher Education, described scientific research as key to adding value to critical thinking and innovations in any country. He noted that Ugandans and Africans in general have a poor attitude towards science and research, which has largely contributed to Africa’s under-development. 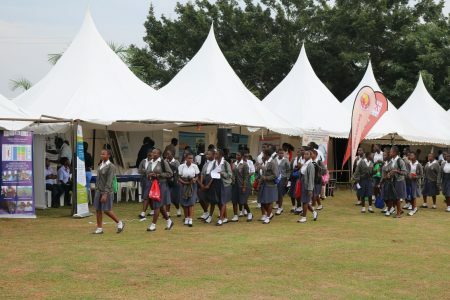 He challenged Ugandans who still view research as a complex and expensive venture to embrace it, adding that science subjects have been made compulsory at ‘O’ level and at ‘A level’. “A student has to study at least one science subject; either mathematics or computer science to encourage scientific reasoning. We want to inspire the young generation to embrace science”, Dr. Muyingo said. The Minister pledged to actively support the UVRI Open Days so that the activities can be extended to other regions which were not in attendance that day. “I am extremely happy that UVRI has come up with this wonderful innovation that will ably aid the teaching of science in schools and also help to shape the students’ science careers”, Dr Muyingo concluded. The UVRI Open Day is a promise of glittering science careers in the future. The UVRI Open day still promises a great opportunity of showcasing on-going research, share findings from previous studies conducted, provide a platform for practicing scientists to interest those that would want to join the scientific research fraternity, ignite new science careers and rejuvenate the fading careers.